• Best portable road map is mentioned AQUI. • Currency exchange rates page HERE. • 46 free maps. Just print and drive from AQUI. Rates : 75CUC per day + 30 centavos cuc per km  including insurance and tourist-guide services of a trained, responsible chauffeur; the Spanish-Cuban company can count on some 20 bilingual drivers and car owners (Renault SM3 above) who can pick up and leave travellers most anywhere on the island. Seeing that rental rates are expensivo and that in case of an accident, the driver is held responsible until a judge proves him/her innocent. Check this out. 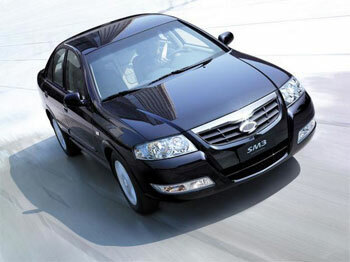 *in March 2015 : $314,75 US for 7 days for a Geely Panda (cheapest) or $451,60 for a medium-size at Havanautos  excluding gasoline or insurance. 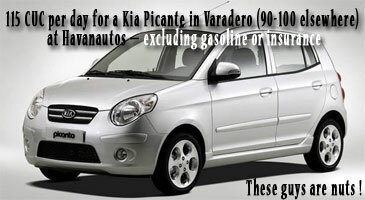 A Kia Picanto high season in Varadero is 47€ plus insurance and gasoline. In March 2013, we tried the services of a professionally-run company owned by Spanish-Cuban interests. In our case, Carlos the driver happened to be the owner of a casa particular and mentioned he had already ran up some 200,000 km in the past two years driving and guiding travellers in his comfortable Renault SM3. ••• The company's drivers own well-maintained cars, are certified tourist guides and, of course, get along in English. ••• Clients determine their own itinerary from home, book their own casas (or hotels) and then can book the car/driver through the company's web site for the start and end dates of the rental. ••• Drivers will take clients wherever they want to go whilst pointing out interesting detours on the less-travelled paths; drivers can tour the stopover city on arrival and take them to any nightspot they wish  looking for taxis and checking maps are not necessary because the driver is the clients' private chauffeur, no one else's. ••• At the end of the day, the driver drops off the travellers for the night, stays in a place of his choice at his own expense and makes an arrangement for the next day's pickup time; drivers can be reached at all times through their cell phone, needless to say. If you still like to take chances and can share the rather high rates with a couple of friends, renting a car and driving on Cuban highways and by-ways is a pleasure. Traffic in large cities can be stressful but roads outside large cities are generally very manageable, pleasant and less trodden, except on weekends when Cubans visit relatives. Only problem with driving in Cuba is a lack of road signs in out-of-the-way regions. Choose among car rental companies from the chart below. You can call these directly from overseas or you can book over the web. All car rental agencies (Cubacar, Havanautos, Via, etc) are wholly-owned by the Cuban government through its four major corporations (Cimex, Cubalse, Cubanacan, Gaviota) so whether you call directly or book through a web site, you'll end up a client of one of these rental companies. Cuban car rental agencies often deal with partners who can be located anywhere like Cuban Connection of Turks and Caicos, carrentalcuba.com registered in Curaçao, rentacarcuba from Madrid, dtcuba.com owned by Cuban Vacacionar Travel and registered in Mexico, novelacuba from Paris and many others. Rental car scams abound, 'cause there's no embargo against car rental fraud in Cuba. You can rent (and pay mucho dinero for) a whole range of automobiles : Audi A3 Cabriolet ($273 per day), Alfa Romeo, BMW, Daihatsu, VW Passat ($110 per day), Hyundai, Mitsubishi, Peugeot, Subaru, Suzuki, Toyota, Volkswagen, Jeeps, 4x4's, minibuses, even Ford or Mercedes camper cars. Hybrids are not yet available. • Daily insurance rate - Make sure you know what will be charged (or a reduced-rate insurance package for a week) : this can make a difference on the bottom line when the car is returned. Automatics are more expensive than manuals. • Rates are easily double those of Florida albeit that market is one of best for low prices in the USA. Weekly Cuban rates are triple what they are in Florida. • Check for bumps and scratches (same process as everywhere else in ze world) and missing parts like the radio antenna, or the hatchback window wiper; you will have to sign the appropriately marked form. • Lights and wiper, radio and cassette check. If you're driving for more than two hours right as you leave the rental, check the oil and the automatic transmission lubricant as well. Ditto for a spare tire check. • Don't leave the rental contract in the glove box. Always keep it with your passport. A lost contract will cost you 50 dollars to replace. 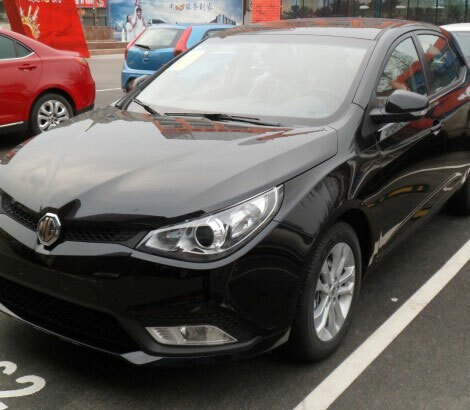 • Don't be surprised if the car has relatively a lot of mileage (70-85,000 km or 42-50,000 miles). 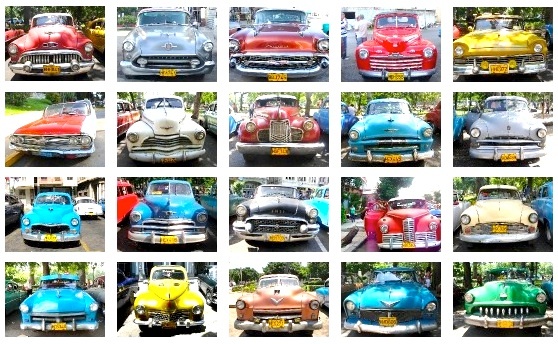 Rentals are not only popular with tourists but Cubans alike so these cars are used a lot. A Cuban may be registered as a 2nd driver for a few cucs per day. • Some agencies offer the rent-it-here, leave-it-there service. The drop-off surcharge should be made clear before leaving : varies from 15-50 to 130-200cuc, depending on the distance between the cities, of course. • Returning the car with the same amount of gas or not ? Up to you to find out and check if the gas tank is indeed half or full or whatever. • Even if the final bill will be in Pesos convertibles (cuc), the amount will be charged to your credit card in US dollars with 1.11% increase and it is that converted receipt you will sign for your credit card. The amount will then converted by your bank into Euros or Canadian dollars, yen, pounds, etc. So you go through two conversions. And you're not even the religious type ! • Cost of petrol is about 1cuc per liter. An International Driving Permit is not required, a valid national licence is sufficient. Note that a driver involved in an accident is judged guilty until proved innocent. • The 200 or 250cuc CDW or collision damage waiver still has to be paid (a debit slip that you sign is issued but not debited from your credit card unless you have an accident in which case the amount pays for the insurance company's cost of the policy). If you have an accident, some credit card companies will cover the CDW. • Bring CD's for music onboard because local radio stations are mostly low wave and cannot usually be easily picked up outside large cities. You can buy music cassettes on the streets for one or 2 cuc each, double and triple in stores. All CD'S sold on the street are pirated and that seems to be the situation everywhere. All companies have a 24-hour emergency number (that you have to call long distance if away from La Habana). • Be prepared to pick-up hitchhikers (botellas) : they're at every bus stop and road crossings between small towns and even along the trans-island highway. Mothers, nurses, lawyers, teachers and lots of students who have to commute between small towns and large institutions or schools, sometimes waiting 4 or 5 hours for a bus that comes late and overfilled. (Some even offer to pay a few pesos for the ride.) It's a great way of striking up anonymous conversations : they don't know you and will most likely never see you again. • Driving back to La Habana, we picked up three young policemen who had stopped the car along the carretera central, asking for a lift. Speeding along (120-130 kmh) the deserted highway, we came up behind a ... police car. We asked the guys if we had to slow down. Nah, go ahead, they said. We did. And never even looked behind to see if the Lada had picked up speed. • If you get stopped for a traffic violation, the ticket receipt handed to you by the police should be presented to the rental car company at the end of your trip : the cost will be added to your bill. We have heard that you can  but never have tried ; )  wheel and deal yourself out of a ticket by slipping a 5cuc bill to the officer. • Backroad, no witnesses... Some wise officers just stop you for nothing at all, thinking they'll inspire your corrupt spirit, especially if they realize you don't understand a word they're saying ! It pays to learn Español, my fren. There's no embargo against car rental fraud in Cuba. • This can happen : the agent will ask you to pay your insurance fees half in cash (going directly to his pocket), half by credit card, claiming that's how it has to be done. Ask for his business card, take his picture and say it ain't so. He'll change his tune. This situation has arisen since many credit cards (mostly Gold and Platinum) will cover car rental insurance so the agent is tempted to claim that it was waived by the customer but charges it half and half. Check with your credit card company before leaving to make sure you benefit from the rental car insurance advantages they may offer. Below are some adresses in the capital, La Habana. Most agencies have satellite offices and talleres (repair shops) in major cities. Our preferred choices are Cubacar/Transtur and Havanautos because they have the most offices on the island as well as the Isla de la Juventud. NOTE: Most Cuban car-rental web sites are incomprehensible, not up-to-date : a waste of bandwidth. You can't rent any of these but you can proly get a ride if it's a taxi particular (private taxi).